Tanu Pandit is in the midst of Diwali shopping. The list includes bathroom tiles for her home in London and gifts for her family there—her husband, Pandit Dinesh, and 28-year-old son, Shomit. They stayed back in London when Pandit, along with her 13-year-old daughter, Shloka, relocated to Mumbai in 2001 to live with her ageing parents. The family of five (her daughter lives in Canada) split for what Pandit believes can be explained as “reasons of the heart". She’s the affable and talkative sort, and in our conversations about her being away from her husband and son, I get a sense of the simple, quasi-philosophical ways in which she interprets her life decisions— that the best things in life are often the most difficult to recognize, why “reason" and “heart" are not antithetical, how she sees herself in her old age. At the end of two long interviews, I leave her home feeling somewhat drained, but positive. Family truths: The living room of Basant V. Birewar and Alka Birewar is the regular meeting place for their large family—two sons, daughters-in-law, daughter, son-in-law and four grandchildren — although the four nuclear families live in separate apartments in the same building. For the generation that’s in its 30s and 40s today, this is an often difficult choice to make. Especially since helping parents live an active, meaningful life without living with, or close to, them has become a possible, effective choice, thanks to technology. This is also the first generation of senior citizens in India that has the luxury of assisted community living and professionally run retirement housing complexes. Real estate companies in cities such as Pune, Bangalore and Chennai—the Ashiana Group, Vascon Engineers Pvt. Ltd, Paranjape Schemes and even the Life Insurance Co.’s housing finance wing—are pushing ideas such as retirement homes and senior-friendly housing, where the architecture, design and housekeeping facilities ensure a convenient life for the aged. Says Shashank Paranjape, director, Paranjape Builders, that built Athashri, a senior-family housing complex at Pashan, Pune: “We researched 30 projects across the world. Something like this costs more to build and brings in 10% less profit than a normal residential complex, but it’s an idea for the future and we wanted to get into it early." A house at Athashri can cost anything between Rs20 lakh and Rs40 lakh, depending on the facilities and size. In the last budget, the Union government launched the reverse mortgage system for senior citizens—seniors can now pledge their house to a bank in return for a lump amount or periodic payments spread over the borrower’s lifetime. Yet, as we found out, many consider these options impersonal and unfit for their parents—the reasons are not just emotional. In March, as the Maintenance and Welfare of Parents and Senior Citizens’ Bill was introduced in Parliament, the old debates about the plight of senior citizens resurfaced in the NGO circuit and social sciences classrooms. A few months later, in September, the Population Council of India published a telling report that said 75% of urban males in Maharashtra live with their parents. The demographic included about 5,000 males in the age group of 30-50—some lived with parents out of compulsion, some out of choice. Curious, and moved by these developments, we wanted to explore further. The first was a Facebook poll. In the most popular and hyperactive social networking site on the Web, 100 people, including friends and friends of friends, got the question: “Would you live with your ageing parents even if they would never ask you to?" Fifty-seven people said yes, citing mostly emotional reasons, and 30 said they would convince parents to move closer to where they live. The first real world experience came a few days later. I met Tanu Pandit at her Mumbai home in Bandra about a fortnight before she and her daughter left for London to spend Diwali with their other family. In Pandit’s absence, I spent the first half-hour at the family’s tastefully done living room with 81-year-old Kanhaiya Sidhwani, Pandit’s father; as warm as his daughter, but a man of few words. The unpretentious living room has about 10 small statues of the Buddha, although they don’t claim to have any particular religious leanings. His father migrated from Karachi to Mumbai in the early 1950s, after Partition. His memories of his trips to Karachi as a young man to shut the family business are vivid, and his pride in the accomplishments of his extended family, including a nephew who is a famous film producer, is hard to miss. Sidhwani’s two children (his son, “in the export business", who he doesn’t speak much of, lives on Napeansea Road in South Mumbai with his wife and children) grew up and were educated in Mumbai, as he expanded a part of his family business of steel and iron parts and bought a home in Bandra. His daughter is now his greatest support (and Shloka, “the heroine of the family", makes him laugh) as he deals with the trauma of an ailing, bedridden wife, 80-year-old Gopi Sidhwani. The family dog, a petulant Daschund, is Sidhwani’s companion. “It was a shock when Tanu told me four years ago that she was coming to live with us. I almost felt guilty, but she was adamant. Look how blessed you can get even in your old age. She and the little one have changed our lives. But I still keep telling her to spend at least five months every time she goes to London," Sidhwani says. Till they came, he used to be surrounded by domestic help of all ages, but was always lonely. In 2001, just before Pandit’s 21-year-old daughter was about to get married to her college sweetheart, she received news from a cousin visiting London that four men had broken into her parents’ house in broad daylight, while her father was away. One held a knife to her mother, who was at that time recovering from a knee fracture, and the rest proceeded to lock the workers in the house in one room. If the nurse taking care of Gopi hadn’t managed to call the neighbours, it could have been much worse. Starting anew: After moving in with her parents in Hyderabad, Sridala Swamy has had the freedom to travel alone. Pandit Dinesh, her husband, is a musician and composer, and the nephew of Pandit Jasraj. 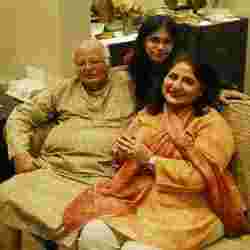 His father Pandit Mani Ram, who was Pandit Jasraj’s guru and father figure, died young. For Dinesh, his wife’s reasons for being close to her parents weren’t difficult to understand: “Indian classical musicians are very rooted in family values, especially if you come from a khandan or gharana of musicians. When I was growing up, I knew I would have to take care of my father no matter what, but that necessity didn’t arise." The support from family members is obviously crucial in taking such a decision. According to a study conducted by Dignity Foundation, a Mumbai-based NGO working towards the rights and welfare of India’s senior citizens—it has also recently opened a home for the aged at Neral, a hilly hamlet close to Mumbai—most people in the age group of 30-45 in the four metros (about 50%) prefer to have their parents live in old-age homes with modern infrastructure and facilities. Says Sheilu Sreenivasan, president and founder of Dignity Foundation: “There is no reason to believe that today’s adults are more caring about their parents or that a lot, or some, of them are choosing to live with parents. But my experiences in many Indian cities show that they are willing to spend time and energy to ensure parents are living safely. Many people call our old-age home from as far as Australia and the US every other day just to ensure that their parents have had the shot of medicine which was due or that gifts were purchased on their behalf and given to them on the due date." Workers at the Dignity Foundation also say that the number of volunteers from the corporate world and the media ready to work on projects related to the welfare of senior citizens has increased dramatically in the last few years. An observation that HelpAge India, a New Delhi-based organization, seconds. Four general managers of ICICI Bank recently signed up to become prospective trustees and consultants for the Dignity Foundation, and advertising agencies such as Lowe Lintas and FCB-Ulka help mobilize funds and advise Sreenivasan’s team. Why then would a 32-year-old poet, writer of children’s books, film editor and documentary film-maker move from New Delhi to Hyderabad? For Sridala Swamy, now 36, both her own desire to go back “home" as well as to be around her parents when they’re growing old coincided, making the transition easy. Initially, the choice seemed daunting: “I’d left home when I was 12, in effect, coming home only for vacations, and my parents had only known me as an adolescent. I, on the other hand, had got used to arranging things as I pleased and wasn’t used to being told what to do." Swamy is an only child, and when she left her busy life in New Delhi, she had just ended her marriage and her three-year-old son, Swayambhu Sudyut, was living with her. Her circumstances were also conducive to her decision to be with her parents. “I’m an only child. If I wasn’t around to help them when they fall ill, they would have no one. I’m happy that they don’t have to make do, like so many older people, because their children live in other cities or other countries. They can rely on me as much as I can on them," Swamy says. The really tangible benefit that has come out of this shift is the freedom to travel alone, leaving her now seven-year-old son with her parents. Last year, Swamy’s first collection of poems, A Reluctant Survivor, was published by the Sahitya Akademi and three of her children’s books are due for release in December. In most cases, parents make the large chunk of adjustments. Although, in the Sidhwani household, father-daughter quibbles are common. Pandit has a simple explanation as for why adjustment problems are unavoidable: “They still think I’m their baby. I still get a barrage of questions when I go out in the evening." A typical Indian parent trait that we’re all likely to have faced as adults, one that 57-year-old Hema Sharma, mother of Poonam Sharma, 30, has consciously shed. Poonam took up a challenging assignment as a sports journalist and producer with ESPN Star in Singapore in 2002. She was just about getting her life in place in the city when, in 2003, her father passed away. An only child, she returned to live with her mother, but left again for Singapore in 2004 when she got married. “In the next three years, my mother visited me every year for four months. But gradually, that became less frequent as she started keeping unwell," says Poonam. In July, the couple returned to New Delhi with less stressful jobs. Poonam now trains TV anchors and reporters. At the family’s Gurgaon home, there’s a lot of shared interest in social work and the media. Hema says that compared to her own parents, she is more adept at adjusting to the ways of her children because being a working mother, (she’s a retired teacher who’s now a social worker) she’s had more exposure to the world that her daughter grew up in. Poonam says that, with age, her mother has become “very emotional"—something she and her husband took time to get used to. For many, living closer instead of together is a better option. We talked to three families—two in Bangalore and one in Mumbai—that avoided the pain of the real adjustment issues. Getting a job at Microsoft after graduating from Indian Institute of Management Calcutta 12 years ago was 42-year-old Kaustav Khaund’s first taste of freedom. Throughout school, and even a large part of college, he lived with his parents, both professors in a college in Guwahati. “I don’t remember being really free to do anything till I was about 25 years old. Now, I respect my own space with my family (wife and a six-year-old daughter)," says the IT professional based in Bangalore. After his father suffered a heart attack five years ago, he persuaded his parents to move to Bangalore, to live in a neighbourhood close to theirs. “It has worked wonderfully, although the adjustment has been done almost entirely by my parents." Khaund expressed quite unequivocally what most people we met perhaps said between the lines. The answer to the question we set out to answer—whether children gain from living with parents—was quite unanimous. For those who have made the choice, it’s not as much about gaining anything tangible as about having the emotional satisfaction of being able to give parents back what they believe they deserve; what sociologist and psychoanalyst Sudhir Kakar considers “a key aspect of Indianness". Nidhi Raj Kapoor, director of HelpAge India, disagrees: “Films portray situations that are far removed from reality and I don’t believe they sensitize people about the problems of ageing alone. Most people who live with parents often do it out of compulsion such as lack of space." Kapoor says statistics show that the trend is towards nuclear families. In the 1981 census, the average number of people per Indian household was 5.55; by 1991, it had declined to 5.1 and today, the figure is pegged at about 4, which is worrisome considering that life expectancy has risen and people are living longer. According to HelpAge’s recent study on senior citizens in Indian cities, currently, 11% of India’s senior citizens live alone or with those people who aren’t relatives. Based on all available data, they predict that by 2025, 25% of those over 60 and 40% of those over 75 are likely to be living alone. The Birewar family in Mumbai has found the middle path—of making the joint family set-up work by preserving the nuclear family arrangement. Theirs is a large nuclear family. The Birewars own Multiorganics Pvt. Ltd, a company that manufactures intermediary chemicals, started by 73-year-old B.V. Birewar 31 years ago and now run by his two sons, Deepak and Abhijit, and son-in-law, Ajit Naik. Abhijit, his wife Rasika and daughter Anika lived with their parents in Bandra before the elder son, Deepak, decided to return from the US and join the family business. The entire family, including Birewar’s daughter Neeta Naik, a paediatric neurologist, decided to live in four separate apartments in the same building at Sion—a bustling, claustrophobic industrial neighbourhood, not far from Bandra. The father’s old house in Bandra was rented and Abhijit bought an apartment, while his siblings, Deepak and Neeta, bought the homes they had been saving for. “It took about six months for everyone to settle in," says Abhijit. The family of 13, including the grandchildren, meet every other day, and each family is comfortable in its own private space. “The main motivation to live in the same building was to live as close to our parents as possible. We know that if our parents are faced with an emergency, we are right next door to rush there. It’s a worry that most people of our age face," says 37-year-old Abhijit. Each family is self-contained financially; the shared space is only for bonding and spending time together in family dinners and outings which, mother Alka Birewar says, happens “at least once in a month, if you take into account the anniversaries and birthdays of each one of us." Neeta Naik says the advantages outweigh the negatives of living so close to each other. “You don’t grow as an individual if you are always with your family members. But alternatively, there’s immense support while raising children and in making important decisions. And above all, there’s the satisfaction that you’re with your parents as they’re growing older. We wouldn’t have taken the decision to live in the same building if not for parents," Naik says. I met the Birewar family a few days before Diwali, when the parents’ home was already illuminated by small paper lamps, and they were about to finalize the menu for the Diwali lunch. As every member of the family dropped in, one by one, to pose for a family portrait, the older Birewars’ living room did begin to resemble the sets of a Hindi film. Noisy laughter accompanied every attempt to get them to pose, sitting or standing next to each other. By dinner time, each family retired to their own homes. A seemingly workable arrangement, at the cost of losing, perhaps, a tiny share of your independence. Ready to embrace the new nuclear family?